Handmade exquisite Set! Stunning Potato shaped Freshwater Pearls with Turquoise are used to make this beautiful set. This elegant Necklace adds a touch of the exotic to any look. 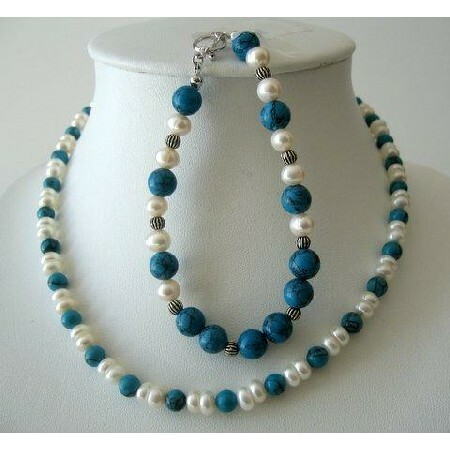 Gleaming Simple & cool Necklace made with Turquoise round beads & Potato Shaped Freshwater Pearls. Perfect Jewelry for summer. This Set consists of Necklace & bracelet with round Turquoise beads & Freshwater Pearls with bali beads. Bracelet closes with a toggle clasp. This gorgeous & lustrous piece you are looking is made from the highest quality material & crafted by professional handmade.